What happens to most people after a weekend of binge drinking results in an unbearable start to the work week? They regret the decision to drink so heavily and promise they will never do it again. This alcohol abuseattitude is normal. It is a reaction in a specific part of the brain responsible for making decisions based on negative consequences. Unfortunately, an alcohol abuser or full-blown alcoholic does not seem to learn from the negative consequences of his or her behaviour. Now researchers think they may know why. Recent laboratory studies indicate that a specific portion of the brain that allows most people to learn from mistakes might be inactive in alcoholics and alcohol abusers. That portion of the brain, known as the lateral habenula, is also present in the brains of rats. The similar brain makeup allowed researchers to deactivate the lateral habenula in lab rats to see if it affected alcohol consumption when the animals were induced to drink. The results were startling. With the lateral habenula deactivated, the rats drank tremendous amounts of alcohol. The researchers described them as being intoxicated to the point of being ‘legally drunk‘ had the animals been human beings. The animals also showed no desire to stop drinking even after enduring the effects of full intoxication. In the control group of rats, in which the lateral habenula remained active, the animals resisted alcohol after having been previously intoxicated. No alcohol addiction type effects were observed. The task for researchers now is three-fold. First, they have to test the human brain to see if temporarily deactivating the lateral habenula results in the same effect. If it does, they have to find out if alcoholics and alcohol abusers are indeed suffering from an inactive lateral habenula. If so, the third part of the equation is to discover how and why that portion of the brain becomes deactivated to begin with. One theory suggests that the gradual increase in alcohol intake directly affects the brain to the point of deactivating the lateral habenula. Such a finding would be compatible with what we already know about alcohol use and brain neurotransmitters. For example, we know that alcohol can encourage the body to produce more dopamine in the brain. Dopamine is a neurotransmitter that encourages feelings of pleasure when we do certain activities. Therefore, if alcohol can stimulate dopamine production, it is reasonable to assume it is also capable of gradually deactivating the lateral habenula. That would explain why alcohol abusers gradually stop being concerned about the negative effects of their behaviour. It would also explain why chronic alcoholics, after years of destructive behaviour, are not the least bit concerned about their own physical health or well-being. Without an active lateral habenula, it might be nearly impossible for them to understand what they are doing to themselves. Another important take away from the story should not be ignored. If it’s true that alcohol abuse can gradually deactivate the lateral habenula, it’s reasonable to conclude the negative effects of excess alcohol consumption serve as a warning not to continue overindulging. In other words, the terrible effects of a hangover should be paid careful attention to as a motivator against further binge drinking. This principle is already used by doctors who prescribe disulfiram to problem drinkers motivated to quit. Disulfiram is a drug that prevents the body from processing alcohol as it normally would, thereby resulting in a severe hangover within minutes of consuming alcohol. 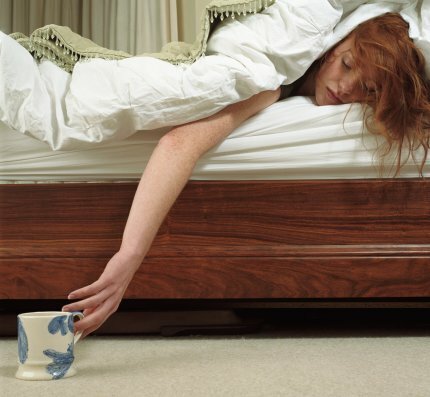 If you are a binge drinker, do yourself a favour and pay attention to your hangover. It is telling you to stop before your brain is unable to learn from your bad experience.